Pie Five Pizza, the only fast-casual pizza chain with a low-carb cauliflower crust, is ready to help you achieve your resolution by kicking off the new year with Cauliflower Crust giveaways, National Gluten-Free Day specials and more! DALLAS, Jan. 8, 2019 /PRNewswire/ -- Is your New Year's resolution to lower your carb intake without skimping on flavor? Pie Five Pizza, the only fast-casual pizza chain with a low-carb cauliflower crust, is ready to help you achieve your resolution by kicking off the new year with Cauliflower Crust giveaways, National Gluten-Free Day specials and more! Sunday, Jan. 13, is National Gluten-Free Day, and Pie Five is celebrating by offering $3 off a $15 online order with promo code P53OFF15. It's the perfect time to try a guilt-free pizza at a guilt-free price! Order at https://order.piefivepizza.com. To keep the Cauliflower Crust craze going, Pie Five will offer double points to Circle of Crust members for Cauliflower Crust purchases randomly throughout January and February. If you're not a member, now is the time! Join at piefivepizza.com/circle-of-crust/. The popular fast-casual restaurant known for its customizable pizzas prepared and ready to enjoy in five minutes or less will also host Cauliflower Crust giveaways on its Facebook and Instagram pages. 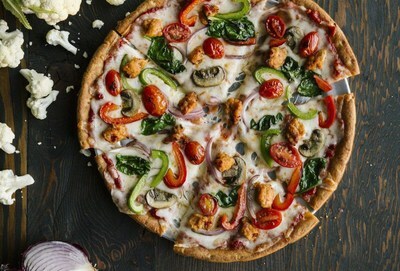 Pie Five's Cauliflower Crust is gluten-free, vegetarian and has only 40 net carbs. That's less than half of the net carbs in any other Pie Five crust! The specialty crust has less than half the sodium found in other crusts and only two grams of sugar. Add some fresh veggies on your personalized pizza and you're set! "Cauliflower is rich in Vitamin C, Vitamin K, health-promoted phytochemicals and anti-inflammatory compounds. It is also an excellent source of natural antioxidants and helps improve digestion and detoxification. It's a great pizza alternative for those looking to cut back on carbs," said Dr. Jeffrey Whitlow, Founder of Nutritional Information Services. "Our Cauliflower Crust was a huge hit last year, so we wanted to keep the excitement going by offering this online special and social giveaways," said Christina Coy, Vice President of Marketing for Pie Five Pizza. "We wanted to give everyone with a healthy New Year's resolution the opportunity to stick to their diets without sacrificing on delicious food. We can't wait to offer more fun giveaways and promos like this in 2019."